Beach homes separated by no more than 20 miles on Puget Sound can be $1,000,000 apart. It's always seemed amazing to me so every year, I chart these differences just to understand this unique market. One afternoon, I showed my charts to a client who asked why I didn’t publish this data on the Net for everyone. Having no good reason, #BelfairWindermere.com was born. This information is taken directly from the Northwest Multiple Listing Service (NWMLS) sales data for 2018 - no editing. To make the charts more accurate for single-family residential homes, NOT INCLUDED are manufactured homes, condominiums and land sales. I hope you find it as interesting as I do. 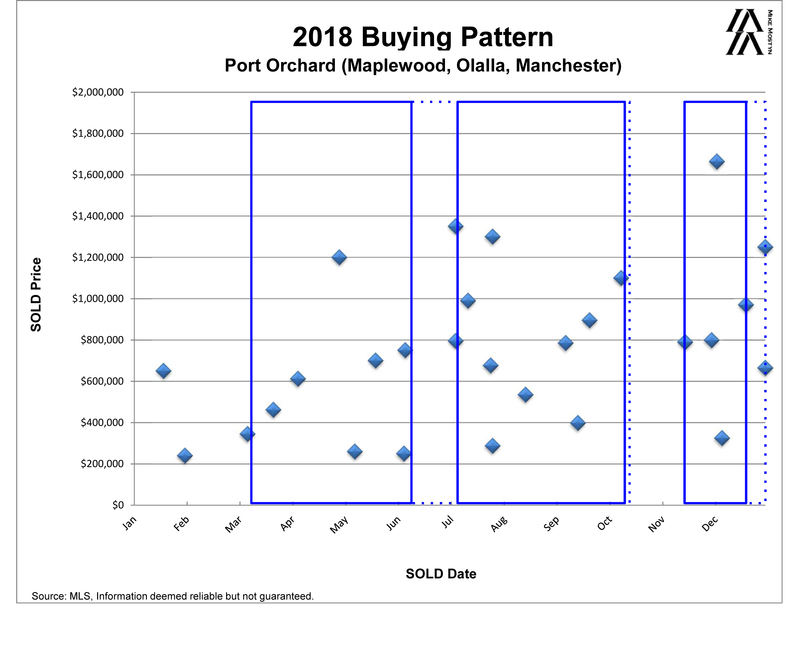 Each dot on this chart is an actual 2018 waterfront home sale – placed on the chart by its price verses its square footage. The line on the charts is a mathematic average calculated from these dots. It shows the average sale price at every given size. By comparing like-size homes in different areas, you get a sense of the prices of homes in each area. DO NOT DETERMINE THE POTENTIAL SELLING PRICE OF YOUR HOME WITH THIS ACTIVITY CHART. MUCH more goes into a “price to sell” than just cost per square foot. Among the largest variables are the amount of waterfront, tideland rights, the proximity and access to the water, the home’s condition & lot size. Price per square foot is just an appraiser’s approach to comparing area values. Why is there such a variation of prices? Some of these beaches are less than 20 miles apart. Some have closer and have easier access, closer shopping, schools and walkability. Is it worth the investment? It depends. Some areas have docks while others don’t. Interestingly, less expensive areas generally have more privacy, larger lots and less taxes. You decide. REMEMBER – Newer Puget Sound waterfront homes aren’t necessarily better. Puget Sound waterfront set-backs have increased dramatically over the years. It is difficult to get a building permit to build a home today closer than 75 feet from the water when in the late 80’s, 25 feet or closer was standard. Newer homes are generally further from the water, smaller in square footage, sit on smaller lots with higher banks and tend to have less privacy. Again, you decide. When do buyers buy waterfront property? 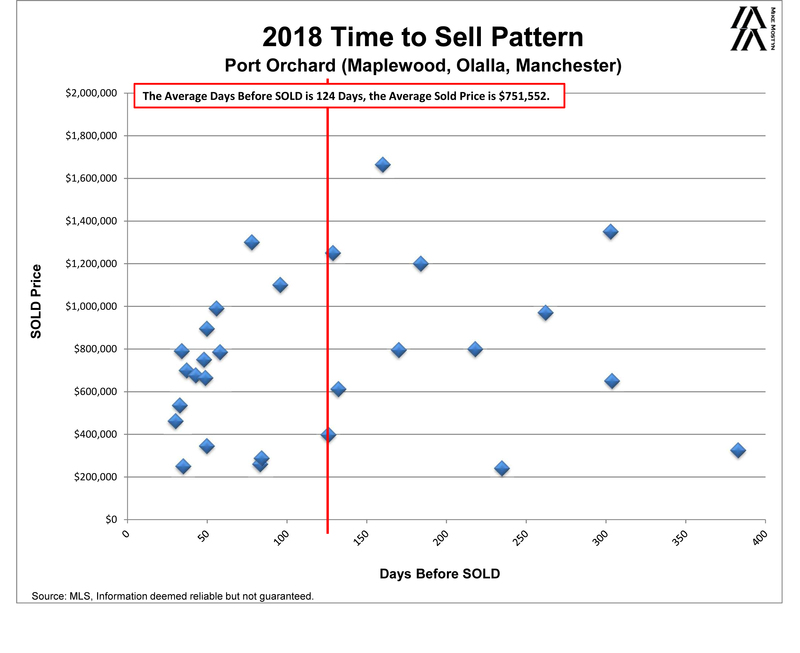 Each dot on this chart is an actual sale - marked by the month it “sold” and its price. REMEMBER: The time it takes to sell includes escrow (45 days or so) for a sale to be completed. A home “sold” in June probably was negotiated and approved in April or May. Generally, higher the price, the more time it takes to sell. Sellers – When to sell? 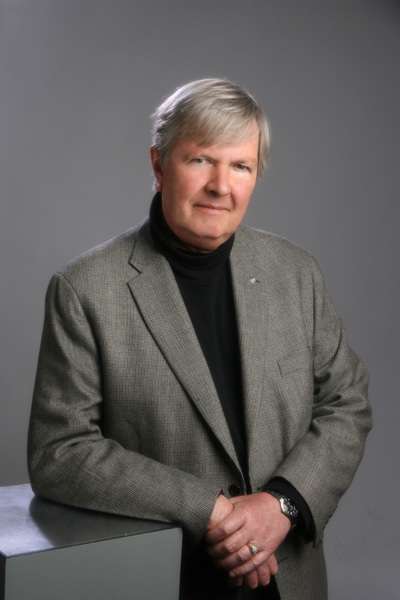 I’m asked this a lot – When is the best time to sell? Try calculating the best time by using sales data. 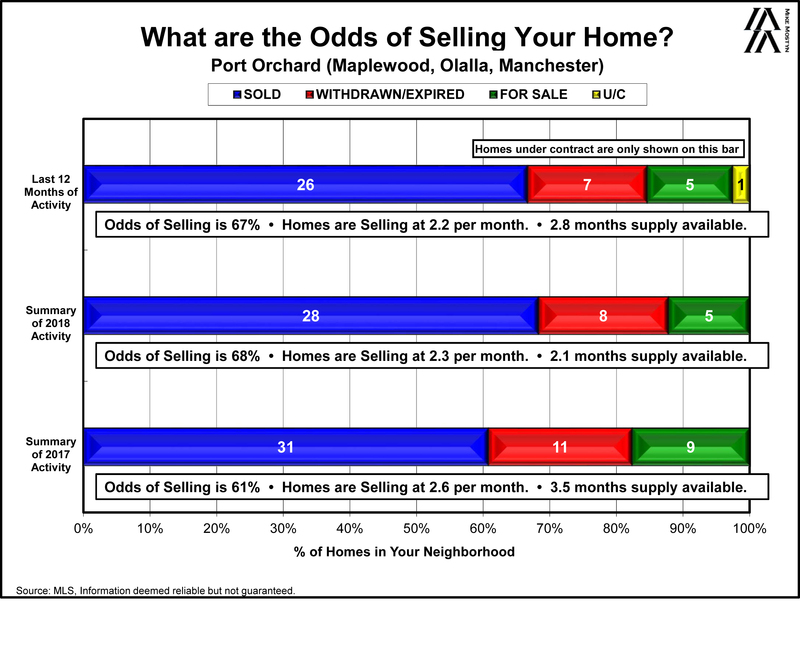 First, look at your area’s buying pattern – when buyers purchase waterfront homes in your area? Then, move back the listing date the average “Days before Sold” in your area and you are close to the best time put your home on the market. This will account for the time required for escrow (45 or so days) and the average period you will need to show your home before you receive an acceptable offer. 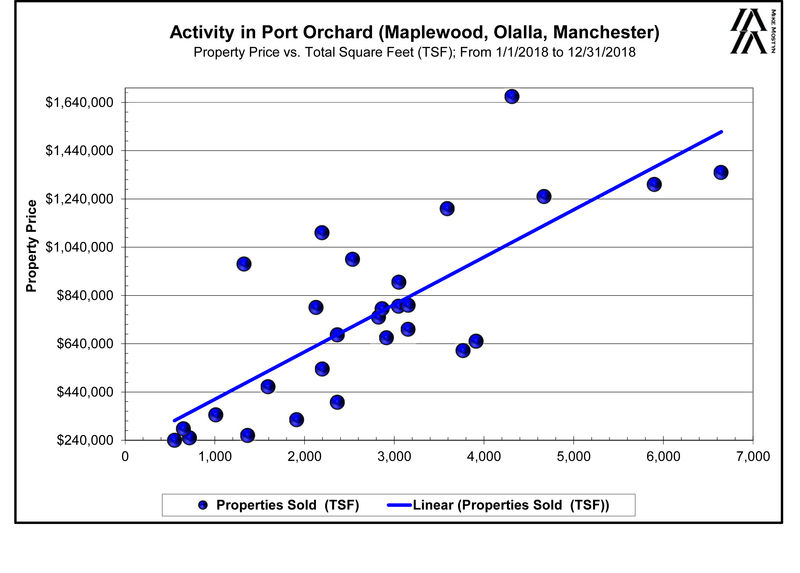 The “Average Sold Price” reported on this chart is also a good way to compare areas but not really. Homes are generally smaller on Hood Canal because there are more vacation properties. Full-time residents require larger homes which are more expensive. How active was the market? I call this the “Odds of Selling”. By knowing how many homes were for sale compared with how many actually sold, you get a sense of overall demand. On Fox Island for example, a higher percentage of homes offered for sale are not sold. Perhaps the price on Fox Island is too high for the demand. Yes, there’s more to it than availability but there is value in knowing this relationship.